...... A small icon indicates which identity is used for each application. ADVrunas is also a powerful console utility that accepts passwords on the command line. * Compatible with Windows Vista and Windows 2000. * Compatible with Remote Desktop (Terminal Services) & Fast User Switching (FUS). * Integrated in Windows Explorer (contextual menus). 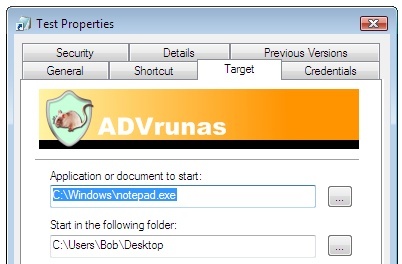 * Convenient shortcut menu to start a Command Prompt with alternate credentials. * Start applications as a limited user (remove administrative rights). * Create encrypted shortcuts with alternative credentials. * Remember which user(s) were used last time you start the application. * Poweful console utility that accept password on the command line. * Indicate who is running which application. Qweas is providing links to ADVrunas 2.3 as a courtesy, and makes no representations regarding ADVrunas or any other applications or any information related thereto. Any questions, complaints or claims regarding this application ADVrunas 2.3 must be directed to the appropriate software vendor. You may click the publisher link of ADVrunas on the top of this page to get more details about the vendor.